16:15 ET: Things are quieting down after a day of protests across the Middle East. Anti-Qaddafi forces control most of Libya, but the Colonel isn’t giving up.Most foreign nationals are by now evacuated. Yemen. More protests will probably happen tomorrow.15:06 ET Malta: Americans evacuated from Libya are disembarking. Al Jazeera suggests this may be a watershed moment for the State Department, which has now shut its embassy and made a reasonable effort to evacuate all Americans. Now it may become a military operation. 14:39 ET Washington: White House Press Secretary Jay Carney says they are preparing targeted sanctions, but he refuses to specify what sanctions or when. Carney says never has a international response happened this quickly. 14:34 ET LIBYA: Saif Qaddafi is expected to give a statement soon. His last statement was bizarre and rambling, like his father’s. 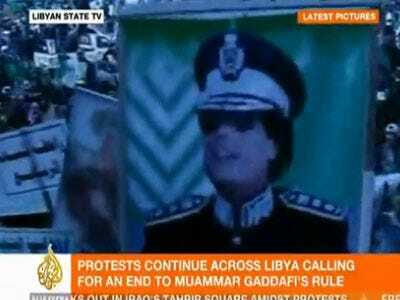 11:53 ET LIBYA: Qaddafi gave a surprise appearance at a presumably rare pro-Qaddafi rally in Tripoli. By the way, reports of the Colonel’s death were exaggerated. 10:36 ET LIBYA: 50,000 protesters are marching on Tripoli. 10 ET LIBYA: Another military base has sided with the protester. 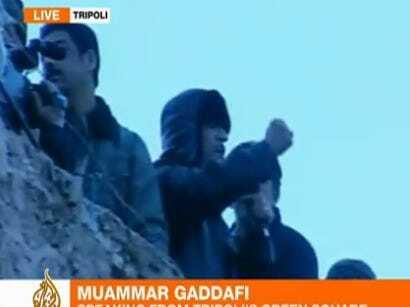 Activists claim they will soon control everything but the bunker where Qaddafi is holed up. 9:50 ET GENEVA: Libya’s diplomats to the UN have said they represent the people and not the regime. DEBKA also claims that Qaddafi’s entire airforce has defected. 9:00 ET LIBYA: An army base in Tajoora just declared support for the protesters. LIBYA: The battle moves to Tripoli, where Qaddafi forces opened fire on protesters. The Colonel is reportedly hiding in an underground bunker outside the city. IRAQ: At least seven have been killed in a Day Of Rage. Protesters threw stones and shoes at riot police in Baghdad’s Tahrir Square. BAHRAIN: Thousands gather for the twelfth day of anti-government protest and the biggest yet. EGYPT: Thousands fill Tahrir Square. They demand the end of emergency law, release of political prisoners and civilian representation in the government. TUNISIA: Military helicopters circle Tunis as tens of thousands turn out in a Day Of Rage. Protesters support the ouster of Qaddafi and figures from their government. YEMEN: Thousands protesting here too.